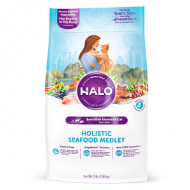 Halo Holistic Sensitive Stomach Seafood Medley for Cats 4/6 lb. 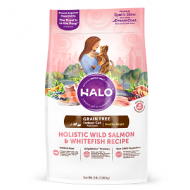 WHOLE whitefish, salmon, whole grains, non-GMO vegetables, and NO “meat meal” of any kind. 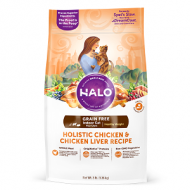 Halo Holistic Healthy Weight Grain Free Chicken and Chicken Liver Recipe for Indoor Cats, 4/6 lb. WHOLE chicken and chicken liver, with chickpeas, non-GMO vegetables and fruits, and NO “meat meal” of any kind. 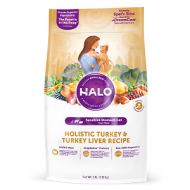 Made with reduced calories and fat, as compared to other Halo adult recipes, and L-carnitine to boost metabolism.